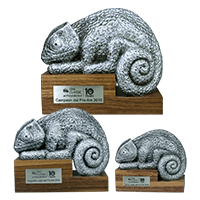 OHL Classic at Mayakoba the Pro-Am winners received Chameleon Trophies designed by the team at Malcolm DeMille in three sizes. These Chameleon sculptures are made in cast aluwhite with antiquing and a coarse bumpy texture that brings them to life! The prizes are mounted to black wood bases with engraved nameplate to designate the three levels of awards.